Research In Motion (s RIMM), already struggling to keep up with nimble competitors like Apple (s AAPL) and Google (s GOOG), signaled that its attempts to catch up are falling behind. The company reported first quarter fiscal 2012 earnings, coming in below expectations for both handsets sold and revenue while painting a challenging outlook for the year ahead. RIM said it will cut headcount as it looks to focus on improving its transition to a new operating system that it hopes will get it back on track. RIM reported revenue of $4.9 billion in the first quarter, up 16 percent from the same period a year ago but down 12 percent from the previous quarter and well below analysts’ estimates of $5.15 billion. Income for the quarter was $695 million, or $1.33 per share, compared to $769 million, or $1.38 per share in the same quarter last year. Handset sales came in at 13.2 million units in the quarter, up from 11.2 million a year ago but below analysts already pessimistic estimates of 13.5 million. The news wasn’t completely unexpected after RIM slashed forecasts for the quarter. But it still came in below the lowered expectations of Wall Street and showed just how tough things are for RIM. The company said the rest of the year was also expected to be trying with second quarter revenue expected to come in at $4.4 to $4.6 billion, compared to a consensus of $5.46 billion. For fiscal 2012, RIM expects earnings of $5.25 to $6 a share, below Wall Street’s expectation of $6.29 a share and well below previous estimates of $7.50 a share. There is a bright spot in the mix with the new PlayBook tablet shipping 500,000 units, a respectable number for a launch marred by missing software. But RIM said the PlayBook 4G, which was expected to have a summer launch, is now slated for this fall. This follows on earlier delays of upcoming BlackBerry 7 phones that won’t ship until this fall. Co-CEO Jim Balsillie said he expects things to pick up in the second half of fiscal 2012 as the cost-cutting measures kick in and RIM starts pushing out new phones. But for now, the delays continue to dog the company and make it hard to be optimistic about RIM’s fading performance. “Fiscal 2012 has gotten off to a challenging start. The slowdown we saw in the first quarter is continuing into Q2, and delays in new product introductions into the very late part of August is leading to a lower than expected outlook in the second quarter,” Balsillie said in a statement. RIM, Nokia (s NOK) and Microsoft (s MSFT) used to be powers in the smartphone market but they’ve struggled to adapt to the challenges brought by Apple and Google. The move to QNX is an important step for RIM to migrate away from its legacy operating system. But like Nokia and Microsoft, RIM doesn’t seem to be able to move with the right amount of urgency. Having to wait out yet another quarter is going to be tough on shareholders, who have to hold on and hope that the promised transition will eventually materialize. There’s still hope, but it’s fading as more and more consumers consider iOS and Android their main two options for smartphones. According to Gartner (s it), RIM’s global market share plunged in the first quarter to 12.8 percent down from 19.7 a year earlier. With the next wave of hardware still slow to come out, expect RIM’s share to drop some more. Co-CEOs Balsillie and Mike Laziridis downplayed the need for a change at the top during a conference call so it appears neither is prepared to go anywhere. Now, the pair will have to weather even more scrutiny about their performance as they plead for a little more patience. The other thing that folks seem to be overlooking is the fact that the PlayBook SHIPPED 500,000 units…..that does NOT mean they have SOLD 500,000 units. I suspect that the numbers sold may only be 200,000 – 250,000….if they were lucky. I had been a BB users for the last 6 odd years and can safely say that they are no longer a factor in the smartphone World. Moved to Android recently and never looked back. QNX aka Playbook for the timebeing is also a move towards walled garden approach like IOS itunes appstore and Microsoft Marketplace. Later when QNX powered phones are launched (maybe mid 2012) these devices will also work in walled garden mode, which will move BB away from acquiring apps from independent stores like GetJar, Mobihand and carrier powered appstores. If BB’s Appworld is available in specific countries by that time it would have no issues otherwise RIM is asking for more trouble. 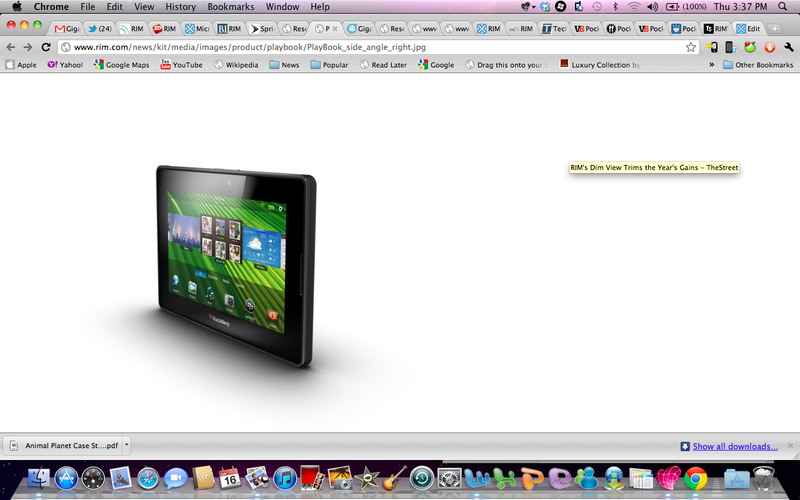 E.g., Playbook launched in Saudi Arabia without Appworld availability. Deadbook for users there. While I agree with the points made about RIM, I believe Microsoft and Nokia have moved with a sense of urgency as of late. Windows mobile 6.5 to Windows phone 7 was a huge urgent change. I decided last month to make the switch from Android to WP7 and must say that Microsoft is pushing in the right direction, while RIM seems to be rather stagnant right now. As mentioned already on various threads – my opinion is that they *COULD* have created a special Android based extension like the sense for *BUSINESS*. Their reputation would make people pay attention and it would also benefit the whole Android eco-system, bringing special applications for business. Sorry, RIM, but you don’t deserve any patience. People have been saying this will happen to you for over 2 years now, and you didn’t listen. You simply brushed them off, thinking it’s crazy talk when you were still making more and more money, which was actually what blinded you from seeing what’s truly wrong with your platform. You kept growing because of your global inertia internationally, not because you had products just as competitive as iPhone or Android phones. So while you were growing on the “sides” of the market, your core market was fading away fast. Sure, it may be obvious to you now that this was happening all along, because you finally took a hit on your overall fincials, but it should’ve been obvious years ago. Now, it’s too late to fix the problem on time. You’ll need years to transition from Blackberry OS to QNX, which is too long in smartphone years. I think the only solution might be to join Android right now, before they get in Nokia’s position where even a transition to another multi-platform OS is too late for them. Their post-sale revenue came from Exchange, so they didn’t take apps seriously. Then they went after consumers who don’t use Exchange, while Apple and Google focused on apps, and Google obviated (most of) the need for Exchange. Crappy touch-screen phones. A tablet that couldn’t stand alone. Once-inspired executives trying to buy sports teams. The wheels just fell off. There’s an opportunity for RIM’s secure messaging bolted onto Exchange, Apps and other UC systems. But it won’t sustain anything like their current market cap, and the execs are too proud to go this way. I feel bad for RIM’s employees. Their management team has dropped the ball on the smart phone transition. Blackberry was THE smart phone before 2007. They had the lead but they just stuck their head in the sand with the belief that the iPhone phenominon was hardware based. Attempted to copy the hardware with the Torch and failed miserably. Unfortunately the phenominon was about the devices OS. It’s much harder to mimic an OS than it is hardware. Now their lead is gone and there is one more gorilla to contend with in Android. It’s going to be near impossible to turn their ship around, especially with the mgmt team that helped get them in this situation. Sorry, not the Torch, the Storm. Ironic name looking back on it. I don’t understand why they can’t come out with a phone that can compete with iOS and Android. Not only is there operating system outdated but so are their phones. It doesn’t help that they keep delaying their new products as well. Another negative impact is that companies are moving beyond or even away from Blackberry devices and opening up their systems to invite Apple and Android phones to use as corporate mobile devices. The hardware is terrible because the hardware is dictated by the limitations of the operating system — there’s absolutely no point in having a dual core Snapdragon in an blackberry when all you can do is BBM message and view webpages in an outdated browser. Really need these new devices to come out and get the native email to the playbook to get things going in the write direction. It seems that RIM can do no right. I couldn’t believe that the Playbook did not come with a native email client. That’s what Blackberry is known for. It’s the beginning of the end or the end of the beginning for RIM.